Mediabank machines are easy to use. Graphic pictures and touch screens let the customer carry out operations in complete autonomy. The software presents a clear path: a short series of quick procedures leads to the withdrawal or the delivery of the items. The system is flexible and allows easy navigation of the menues. Just insert the card to put the machine into action. The main menu offers the possibility of choosing different operations: drawing, return and reloading of the card. If you click info you are sent to an information page containing the customer's data (personal data, credit of the card, goods rented). In the selectors with touch screen, the option WWW gives access to Internet and changes the selector in an Internet browser. When a customer selects an operation the machine asks him for the PIN (personal identification number). The drawing option introduces the choice of items: VHS, DVD, music CD, playstation CD. One can draw more items again through subsequent inquiries, without inserting the card again, according to a maximum number prefixed with every customer. Regarding films, the machines hold lists of the ones available in all connected distributors, posters and data concerning genre, author and leading characters. The pages are built dynamically according to available films. The menu allows for scrolling the film list and for selecting the preferred one. The inquiry can be done either with the initials of the title or with each film code. 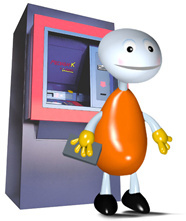 After the option selection, the machine gives information about costs, determined according to criteria fixed by the manager; the customer can accept and confirm the withdrawal or cancel the operation. The consultation software provides a page of messages with information addressed to all the users and communications reserved to a specific customer; it is possible to answer the manager's requests as well. One can book an item directly at the distributor or by a selector. The selector shows the distributor where to draw the product from. The user inserts the card into the indicated distributor that delivers the item immediatly. Mediabank machines are compatible with credit cards (in selected countries). 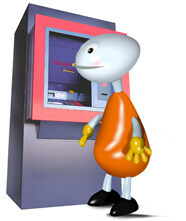 Anybody can withdraw a product without purchasing a membership card, by inserting his own credit card into the machine. His data is registered and he becomes a member of the videoclub automatically. So he can do any operation. Reloading a card is very easy. 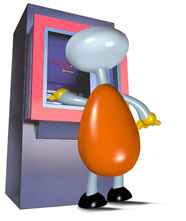 It is sufficient to select the item reload from the main menu and to insert money. In countries where the laws allows it, reloading can also be done through credit cards.